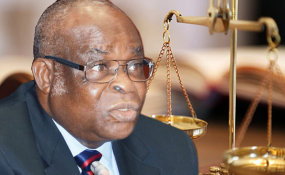 The Code of Conduct Tribunal (CCT) on Wednesday ordered the arrest of the suspended Chief Justice of Nigeria, Walter Onnoghen. The tribunal asked the Inspector General of Police and the Director-General of the State Security Service (SSS) to arrest and produce Mr Onnoghen. The Chairman of CCT, Danladi Umar, issued the bench warrant following the absence of Mr Onnoghen in court. He added that Mr Onnoghen must be available for arraignment on February 15. Mr Umar had at the last sitting informed the defence team that his tribunal would need Mr Onnoghen to be present at the next adjourned date, which is today. This is after Mr Onnoghen's counsel filed an application arguing that the CCT lacked the jurisdiction to try the chief justice. According to Mr Umar, any application against the jurisdiction of the court would only be entertained after the plea of the accused has been taken. Mr Onnoghen is facing trial on six counts of alleged false assets declaration. He was charged by the federal government after he was found culpable by the Code of Conduct Bureau which received a petition from an ally of President Muhammadu Buhari. Mr Buhari then suspended the chief justice despite the opposition of many Nigerians including the Nigerian Bar Association which argued that the president has no such powers to suspend the head of another branch of government.